"Miles" redirects here. For other uses, see Mile (disambiguation) and Miles (disambiguation). The mile is an English unit of length of linear measure equal to 5,280 feet, or 1,760 yards, and standardised as exactly 1,609.344 metres by international agreement in 1959. With qualifiers, "mile" is also used to describe or translate a wide range of units derived from or roughly equivalent to the Roman mile, such as the nautical mile (now 1.852 km exactly), the Italian mile (roughly 1.852 km), and the Chinese mile (now 500 m exactly). The Romans divided their mile into 5,000 roman feet but the greater importance of furlongs in pre-modern England meant that the statute mile was made equivalent to 8 furlongs or 5,280 feet in 1593. This form of the mile then spread to the British-colonized nations some of which continue to employ the mile. The US Geological Survey now employs the metre for official purposes but legacy data from its 1927 geodetic datum has meant that a separate US survey mile (6336/3937 km) continues to see some use. While most countries replaced the mile with the kilometre when switching to the International System of Units, the international mile continues to be used in some countries, such as Liberia, Myanmar, the United Kingdom, the United States, and a number of countries with fewer than one million inhabitants, most of which are UK or US territories, or have close historical ties with the UK or US. The mile was usually abbreviated m. in the past but is now sometimes written as mi to avoid confusion with the SI metre. However, derived units, such as miles per hour or miles per gallon, continue to be universally abbreviated as mph and mpg, respectively. The modern English word mile derives from Middle English myl and Old English mīl, which was cognate with all other Germanic terms for "miles". These derived from apocopated forms of the Latin mīlia or mīllia, the plural of mīle or mīlle,[n 1] literally "thousand" but used as a clipped form of mīlle passus or passuum, the Roman mile of one thousand paces. The present international mile is usually what is understood by the unqualified term "mile". When this distance needs to be distinguished from the nautical mile, the international mile may also be described as a "land mile" or "statute mile". 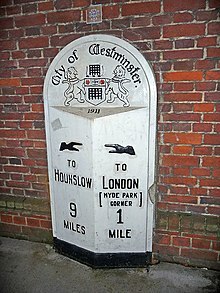 In British English, the "statute mile" may refer to the present international miles or to any other form of English mile since the 1593 Act of Parliament, which set it as a distance of 1,760 yards. Under American law, however, the "statute mile" refers to the US survey mile. Foreign and historical units translated into English as miles usually employ a qualifier to describe the kind of mile being used but this may be omitted if it is obvious from the context, such as a discussion of the 2nd-century Antonine Itinerary describing its distances in terms of "miles" rather than "Roman miles". The mile has been variously abbreviated—with and without a trailing period—as m, M, ml, and mi. The American National Institute of Standards and Technology now uses and recommends mi in order to avoid confusion with the SI metre (m) and millilitre (ml). However, derived units such as miles per hour or miles per gallon continue to be abbreviated as mph and mpg rather than mi/h and mi/gal. In the United Kingdom road signs use m as the abbreviation for mile though height and width restrictions also use m as the abbreviation for the metre, which may be displayed alongside feet and inches. The BBC style holds that "There is no acceptable abbreviation for 'miles'" and so it should be spelt out when used in describing areas. The Roman mile (mille passus, lit. "thousand paces"; abbr. m.p. ; also milia passuum[n 2] and mille) consisted of a thousand paces as measured by every other step—as in the total distance of the left foot hitting the ground 1,000 times. The ancient Romans, marching their armies through uncharted territory, would often push a carved stick in the ground after each 1,000 paces. Well-fed and harshly driven Roman legionaries in good weather thus created longer miles. The distance was indirectly standardised by Agrippa's establishment of a standard Roman foot (Agrippa's own) in 29 BC, and the definition of a pace as 5 feet. An Imperial Roman mile thus denoted 5,000 Roman feet. Surveyors and specialized equipment such as the decempeda and dioptra then spread its use. In modern times, Agrippa's Imperial Roman mile was empirically estimated to have been about 1,617 yards (1,479 m) in length. In Hellenic areas of the Empire, the Roman mile (Greek: μίλιον, mílion) was used beside the native Greek units as equivalent to 8 stadia of 600 Greek feet. The mílion continued to be used as a Byzantine unit and was also used as the name of the zero mile marker for the Byzantine Empire, the Milion, located at the head of the Mese near Hagia Sophia. The Roman mile also spread throughout Europe, with its local variations giving rise to the different units below. Also arising from the Roman mile is the "milestone". All roads radiated out from the Roman Forum throughout the Empire – 50,000 miles of stone-paved roads. At every mile was placed a shaped stone, on which was carved a Roman numeral, indicating the number of miles from the center of Rome – the Forum. Hence, one always knew how far one was from Rome. The Italian mile (miglio, pl. miglia) was traditionally considered a direct continuation of the Roman mile, equal to 1000 paces, although its actual value over time or between regions could vary greatly. It was often used in international contexts from the Middle Ages into the 17th century and is thus also known as the "geographical mile", although the geographical mile is now a separate standard unit. The Arabic mile (الميل, al-mīl) was not the common Arabic unit of length; instead, Arabs and Persians traditionally used the longer parasang or "Arabic league". The Arabic mile was, however, used by medieval geographers and scientists and constituted a kind of precursor to the nautical or geographical mile. It extended the Roman mile to fit an astronomical approximation of 1 arcminute of latitude measured directly north-and-south along a meridian. Although the precise value of the approximation remains disputed, it was somewhere between 1.8 and 2.0 km. The "old English mile" of the medieval and early modern periods varied but seems to have measured about 1.3 international miles (1.9 km). The English long continued the Roman computations of the mile as 5000 feet, 1000 paces, or 8 longer divisions, which they equated with their "furrow's length" or furlong. The origins of English units are "extremely vague and uncertain", but seem to have been a combination of the Roman system with native British and Germanic systems both derived from multiples of the barleycorn. [n 3] Probably by the reign of Edgar in the 10th century, the nominal prototype physical standard of English length was an arm-length iron bar (a yardstick) held by the king at Winchester; the foot was then one-third of its length. Henry I was said to have made a new standard in 1101 based on his own arm. Following the issuance of Magna Carta, the barons of Parliament directed John and his son to keep the king's standard measure (Mensura Domini Regis) and weight at the Exchequer, which thereafter verified local standards until its abolition in the 19th century. New brass standards are known to have been constructed under Henry VII and Elizabeth I.
Arnold's c. 1500 Customs of London recorded a mile shorter than previous ones, coming to 0.947 international miles or 1.524 km. The English statute mile was established by a Weights and Measures Act of Parliament in 1593 during the reign of Queen Elizabeth I. The act on the Composition of Yards and Perches had shortened the length of the foot and its associated measures, causing the two methods of determining the mile to diverge. Owing to the importance of the surveyor's rod in deeds and surveying undertaken under Henry VIII, decreasing the length of the rod by ​1⁄11 would have amounted to a significant tax increase. Parliament instead opted to maintain the mile of 8 furlongs (which were derived from the rod) and to increase the number of feet per mile from the old Roman value. The applicable passage of the statute reads: "A Mile shall contain eight Furlongs, every Furlong forty Poles,[n 4] and every Pole shall contain sixteen Foot and an half." The statute mile therefore contained 5,280 feet or 1,760 yards. The distance was not uniformly adopted. Robert Morden had multiple scales on his 17th-century maps which included continuing local values: his map of Hampshire, for example, bore two different "miles" with a ratio of 1 : 1.23 and his map of Dorset had three scales with a ratio of 1 : 1.23 : 1.41. In both cases, the traditional local units remained longer than the statute mile. The Welsh mile (milltir or milldir) was 3 miles and 1470 yards long (6.17 km). It comprised 9000 paces (cam), each of 3 Welsh feet (troedfedd) of 9 inches, usually reckoned as equivalent to the English inch. Along with other Welsh units, it was said to have been codified under Dyfnwal the Bald and Silent and retained unchanged by Hywel the Good. Along with other Welsh units, it was discontinued following the conquest of Wales by the English under Edward I in the 13th century. The Scots mile was longer than the English mile, as mentioned by Robert Burns in the first verse of his poem "Tam o' Shanter". It comprised 8 (Scots) furlongs divided into 320 falls or faws (Scots rods). It varied from place to place but the most accepted equivalencies are 1,976 Imperial yards (1.123 statute miles or 1.81 km). It was legally abolished three times: first by a 1685 act of the Scottish Parliament, again by the 1707 Treaty of Union with England, and finally by the Weights and Measures Act 1824. It had continued in use as a customary unit through the 18th century but had become obsolete by its final abolition. The Irish mile (míle or míle Gaelach) measured 2240 yards: approximately 1.27 statute miles or 2.048 kilometres. It was used in Ireland from the 16th century plantations until the 19th century, with residual use into the 20th century. The units were based on "English measure" but used a linear perch measuring 7 yards (6.4 m) as opposed to the English rod of 5.5 yards (5.0 m). The Dutch mile (Mijl) has had different definitions throughout history. One of the older definitions was 5600 ells. But the length of an ell was not standardised, so that the length of a mile could range between 3280 m and 4280 m. The Dutch mile also has had historical definitions of one hour's walking (Uur gaans), which meant around 5 km, or 20,000 Amsterdam or Rhineland feet (respectively 5660 m or 6280 m). Besides the common Dutch mile, there is also the geographical mile. 15 geographical Dutch miles equal one degree of longitude on the equator. Its value changed as the circumference of the earth was estimated to a better precision. But at the time of usage, it was around 7157 m. The metric system was introduced in the Netherlands in 1816, and the metric mile became a synonym for the kilometer, being exactly 1000 m. Since 1870, the term "mile" was replaced by the equivalent "kilometer". Today, the word "mile" is no longer used, apart from some old proverbs. The German mile (Meile) was 24,000 German feet. The standardised Austrian mile used in southern Germany and the Austrian Empire was 7.586 km; the Prussian mile used in northern Germany was 7.5325 km. Following its standardisation by Ole Rømer in the late 17th century, the Danish mile (mil) was precisely equal to the Prussian mile and likewise divided into 24,000 feet. These were sometimes treated as equivalent to 7.5 km. Earlier values had varied: the Sjællandske miil, for instance, had been 11.13 km. The Germans also used a longer version of the geographical mile. The Saxon Post mile (kursächsische Postmeile or Polizeimeile, introduced on occasion of a survey of the Saxon roads in the 1700s, corresponded to 2000 Dresden rods, equivalent to 9.062 kilometres. The Hungarian mile (mérföld or magyar mérföld) varied from 8.3790 km to 8.9374 km before being standardised as 8.3536 km. The Portuguese mile (milha) used in Portugal and Brazil was 2.0873 km prior to metrication. The Russian mile (миля or русская миля, russkaya milya) was 7.468 km, divided into 7 versts. The Croatian mile (hrvatska milja), first devised by the Jesuit Stjepan Glavač on a 1673 map, is the length of an arc of the equator subtended by 1/10° or 11.13 km exactly. The previous Croatian mile, now known as the "ban mile" (banska milja), had been the Austrian mile given above. The Ottoman mile was 1,894.35 m (1.17709 mi), which was equal to 5,000 Ottoman foot. After 1933, the Ottoman mile was replaced with the modern Turkish mile (1,853.181 m). The international mile is precisely equal to 7003160934400000000♠1.609344 km (or 25146/15625 km as a fraction). It was established as part of the 1959 international yard and pound agreement reached by the United States, the United Kingdom, Canada, Australia, New Zealand, and Union of South Africa, which resolved small but measurable differences that had arisen from separate physical standards each country had maintained for the yard. As with the earlier statute mile, it continues to comprise 1,760 yards or 5,280 feet. The old Imperial value of the yard was used in converting measurements to metric values in India in a 1976 Act of the Indian Parliament. However, the current National Topographic Database of the Survey of India is based on the metric WGS-84 datum, which is also used by the Global Positioning System. The exact length of the land mile varied slightly among English-speaking countries until the international yard and pound agreement in 1959 established the yard as exactly 0.9144 metres, giving a mile exactly 1,609.344 metres. The U.S. adopted this international mile for most purposes, but retained the pre-1959 mile for some land-survey data, terming it the U. S. survey mile. In the United States, statute mile normally refers to the survey mile, about 3.219 mm (​1⁄8 inch) longer than the international mile (the international mile is exactly 0.0002% less than the U.S. survey mile). While most countries replaced the mile with the kilometre when switching to the International System of Units, the international mile continues to be used in some countries, such as Liberia, Myanmar, the United Kingdom and the United States. It is furthermore used in a number of countries with vastly less than a million inhabitants, most of which are UK or US territories, or have close historical ties with the UK or US: American Samoa, Bahamas, Belize, British Virgin Islands, Cayman Islands, Dominica, Falkland Islands, Grenada, Guam, The N. Mariana Islands, Samoa, St. Lucia, St. Vincent & The Grenadines, St. Helena, St. Kitts & Nevis, the Turks & Caicos Islands, and the U.S. Virgin Islands. The mile is even encountered in Canada, though this is predominantly in rail transport and horse racing, as the roadways have been metricated since 1977. The U.S. survey mile is 5,280 survey feet, or about 1,609.347 metres. In the United States, statute mile formally refers to the survey mile, but for most purposes, the difference between the survey mile and the international mile is insignificant—one international mile is 6999999998000000000♠0.999998 U.S. survey miles—so statute mile can be used for either. But in some cases, such as in the U.S. State Plane Coordinate Systems (SPCSs), which can stretch over hundreds of miles, the accumulated difference can be significant, so it is important to note that the reference is to the U.S. survey mile. The United States redefined its yard in 1893, but this resulted in U.S. and Imperial measures of distance having very slightly different lengths. The North American Datum of 1983 (NAD83), which replaced the NAD27, is defined in meters. State Plane Coordinate Systems were then updated, but the National Geodetic Survey left individual states to decide which (if any) definition of the foot they would use. All State Plane Coordinate Systems are defined in meters, and 42 of the 50 states only use the metre-based State Plane Coordinate Systems. However, eight states also have State Plane Coordinate Systems defined in feet, seven of them in U.S. Survey feet and one in international feet. State legislation in the U.S. is important for determining which conversion factor from the metric datum is to be used for land surveying and real estate transactions, even though the difference (2 ppm) is hardly significant, given the precision of normal surveying measurements over short distances (usually much less than a mile). Twenty-four states have legislated that surveying measures be based on the U.S. survey foot, eight have legislated that they be based on the international foot, and eighteen have not specified which conversion factor to use. On the utility of the nautical mile. Each circle shown is a great circle—the analog of a line in spherical trigonometry—and hence the shortest path connecting two points on the globular surface. Meridians are great circles that pass through the poles. The nautical mile was originally defined as one minute of arc along a meridian of the Earth. Navigators use dividers to step off the distance between two points on the navigational chart, then place the open dividers against the minutes-of-latitude scale at the edge of the chart, and read off the distance in nautical miles. The Earth is not perfectly spherical but an oblate spheroid, so the length of a minute of latitude increases by 1% from the equator to the poles. Using the WGS84 ellipsoid, the commonly accepted Earth model for many purposes today, one minute of latitude at the WGS84 equator is 6,046 feet and at the poles is 6,107.5 feet. The average is about 6,076 feet (about 1,852 metres or 1.15 statute miles). In the United States, the nautical mile was defined in the 19th century as 6,080.2 feet (1,853.249 m), whereas in the United Kingdom, the Admiralty nautical mile was defined as 6,080 feet (1,853.184 m) and was about one minute of latitude in the latitudes of the south of the UK. Other nations had different definitions of the nautical mile, but it is now internationally defined to be exactly 1,852 metres (6,076.11548556 feet). The nautical mile per hour is known as the knot. Nautical miles and knots are almost universally used for aeronautical and maritime navigation, because of their relationship with degrees and minutes of latitude and the convenience of using the latitude scale on a map for distance measuring. The data mile is used in radar-related subjects and is equal to 6,000 feet (1.8288 kilometres). The radar mile is a unit of time (in the same way that the light year is a unit of distance), equal to the time required for a radar pulse to travel a distance of two miles (one mile each way). Thus, the radar statute mile is 10.8 μs and the radar nautical mile is 12.4 μs. The geographical mile is based upon the length of a meridian of latitude. The German geographical mile (geographische Meile) was previously ​1⁄15° of latitude (7.4127 km). The informal term "metric mile" is used in sports such as track and field athletics and speed skating to denote a distance of 1,500 metres (4,921 ft). In United States high-school competition, the term is sometimes used for a race of 1,600 metres (5,249 ft). The Scandinavian mile (mil) remains in common use in Norway and Sweden, where it has meant precisely 10 km since metrication occurred in 1889. It is used in informal situations and in measurements of fuel consumption, which are often given as litres per mil. In formal situations (such as official road signs) and where confusion may occur with international miles, it is avoided in favour of kilometres. The Swedish mile was standardised as 36,000 Swedish feet or 10.687 km in 1649; before that it varied by province from about 6 to 14.485 km. Before metrication, the Norwegian mile was 11.298 km. The traditional Finnish peninkulma was translated as mil in Swedish and also set equal to 10 km during metrication in 1887, but is much less commonly used. A comparison of the different lengths for a "mile", in different countries and at different times in history, is given in the table below. Leagues are also included in this list because, in terms of length, they fall in between the short West European miles and the long North, Central and Eastern European miles. 01,609.344 mile international 1959 today 1,760 yards Until 1 July 1959 the imperial mile was a standard length worldwide. The length given in metres is exact. 02,220 Gallo-Roman league Gallo-Roman culture 1.5 miles Under the reign of Emperor Septimius Severus, this replaced the Roman mile as the official unit of distance in the Gallic and Germanic provinces, although there were regional and temporal variations. 03,898 French lieue (post league) France 2,000 "body lengths"
10.688.54 mil Sweden 1889 In normal speech, "mil" means a Scandinavian mile of 10 km. 11,299 mil Norway was equivalent to 3000 Rhenish rods. A country mile is used colloquially to denote a very long distance. ^ Scandinavian miles probably derived from Middle Low German, while the terms in Romance languages developed variously from the singular and plural Latin forms. ^ A partitive genitive construction literally meaning "one thousand of paces". ^ The c. 1300 Composition of Yards and Perches, a statute of uncertain date usually reckoned as an enactment of Edward I or II, notionally continued to derive English units from three barleycorns "dry and round" to the inch and this statute remained in force until the 1824 Weights and Measures Act establishing the Imperial system. In practice, official measures were verified using the standards at the Exchequer or simply ignored. ^ "Pole" being another name for the rod. ^ When reading the document it helps to bear in mind that 999,998 = 3,937 × 254. ^ a b OED (2002), "mile, n.1". ^ AHD (2006), "mile, 1". ^ a b Thompson (2008), B.6..
^ Butcher (2014), p. C-16. ^ "Road traffic: The traffic signs regulations and general directions 2015" (PDF). gov.uk. ^ Lease (1905), p. 211. ^ Smith (1875), p. 171. ^ Lesley Adkins; Roy A. Adkins; Both Professional Archaeologists Roy A Adkins (14 May 2014). Handbook to Life in Ancient Rome. Infobase Publishing. pp. 199–. ISBN 978-0-8160-7482-2. ^ Andrews (2003), p. 70. ^ a b c Klein (1988), p. 69. ^ a b c d Chisholm (1864), p. 8. ^ a b c NPL. ^ Chisholm (1864), p. 37. ^ Chisolm (1864), p. 8. ^ Chisholm (1864), p. 4. ^ Zupko (1977), pp. 10–11, 20–21. ^ Burke (1978), Ch. 9. ^ Statutes at large from the first year of King Edward the fourth to the end of the reign of Queen Elizabeth. Vol. II. 1763. p. 676. Retrieved 29 November 2011. ^ Act 35 Eliz. I cap. 6, s. 8. ^ Owen (1841), Book II, Ch. XVII, §5. ^ Owen (1841), Book II, Ch. XVII, §2. ^ Edinburgh 2000 visitors' guide. Collins. 1999. p. 31. ISBN 978-0-004-49017-5. ^ a b "mile". Dictionary of the Scottish Language – Scottish National Dictionary. ^ "fall, faw". Dictionary of the Scottish Language – Dictionary of the Older Scottish Tongue. ^ "Act for a standard of miles" (June 16, 1685). APS viii: 494, c.59. RPS 1685/4/83. ^ Union with England Act 1707 (c. 7), art. 17. ^ Rowlett (2005), "Irish mile". ^ a b Ordnance Survey Ireland. "Frequently Asked Questions". Archived from the original on February 28, 2012. Retrieved February 17, 2009. ^ a b c Rowlett (2005), "mil 4". ^ "Historie der Postsäulen" (in German). Forschungsgruppe Kursächsische Postmeilensäulen e.V. und 1. Sächsischer Postkutschenverein e.V. Retrieved 5 February 2017. ^ (in Croatian) "Centuries of Natural Science in Croatia : Theory and Application". Kartografija i putopisi. ^ "Schedule I, Part VI", Weights & Measures Act of 1985 . ^ 1,760 yards × 0.9144 m/yard. ^ Barbrow (1976), pp. 16–17, 20. ^ Schedule to the Standards of Weights and Measures Act, 1976. ^ Survey of India, "National Map Policy – 2005 Archived 2010-03-31 at the Wayback Machine". ^ Convert mile [statute] to mile [statute, US] "1 metre is equal to 6996621371192237000♠0.000621371192237 mile [statute], or 6996621369949495000♠0.000621369949495 mile [statute, US]. ... The U.S. statute mile (or survey mile) is defined by the survey foot. This is different from the international statute mile, which is defined as exactly 1609.344 meters. The U.S. statute mile is defined as 5,280 U.S. survey feet, which is around 7003160934721900000♠1609.347219 meters." ^ UK Parliament. The Units of Measurement Regulations 1995 as made, from legislation.gov.uk. ^ Hayner, Jeff (2012-11-29). "ASAA planning 1.2 mile swim in Pago Pago harbor". Samoa News. Retrieved 2014-01-18. ^ "The Nassau Guardian". The Nassau Guardian. 2012-08-29. Retrieved 2014-01-18. ^ Jerome Williams (2013-08-30). "Pawpa Brown Race results". Amandala.com.bz. Retrieved 2014-01-18. ^ "Mt. bikers compete in Anegada". Bvibeacon.com. 2013-05-08. Retrieved 2014-01-18. ^ a b "Paddling 300 miles for NCVO". Compasscayman.com. 2013-06-04. Retrieved 2014-01-18. ^ "Bronze medal for Falklands football at Island Games in Bermuda". Penguin-news.com. 2013-07-24. Archived from the original on 2015-09-24. Retrieved 2014-01-18. ^ "Find the culprit!!!". Spicegrenada.com. Archived from the original on 2013-09-16. Retrieved 2014-01-18. ^ "Navy evacuates patient from cruise ship 50 miles off Guam". guampdn.com. 2013-03-09. Archived from the original on 2013-09-16. Retrieved 2014-01-18. ^ IP&E launches Lucky 7 Mile Advantage promotion "... through Sept. 9, 2013"
^ When you need to go "Dear Editor, I'm deeply concerned about the lack of public toilets around the coast ..."
^ "The Voice – The national newspaper of St. Lucia since 1885". Thevoiceslu.com. 2008-02-08. Archived from the original on 2013-10-29. Retrieved 2014-01-18. ^ "Peace Corps Volunteer runs 49 miles from Petit Bordel to Georgetown". Searchlight.vc. 2011-12-16. Retrieved 2014-01-18. ^ "And I would walk 50 miles..." Sthelenaonline.org. 2012-10-07. Archived from the original on 2014-03-22. Retrieved 2014-01-18. ^ "104 Square Miles, but is it ours?". The St. Kitts-Nevis Observer. 2012-09-28. Archived from the original on 2013-02-01. Retrieved 2014-01-18. ^ "Provo has a new club". Suntci.com. 2009-07-15. Retrieved 2014-01-18. ^ AARON GRAY (Daily News Staff) (2012-02-27). "Butler outduels archrival to win 8 Tuff Miles". Virgin Islands Daily News. Archived from the original on 2013-09-16. Retrieved 2014-01-18. ^ Weights and Measures Act, accessed February 2012, Act current to 2012-01-18. Canadian units (5) The Canadian units of measurement are as set out and defined in Schedule II, and the symbols and abbreviations therefor are as added pursuant to subparagraph 6(1)(b)(ii). ^ Transportation Safety Board of Canada, accessed February 2012, Rail Report – 2010 – Report Number R10E0096. Other Factual Information (See Figure 1). 2. Assignment 602 travelled approximately 12 car lengths into track VC-64 and at a speed of 9 mph struck a stationary cut of 46 empty cars (with the air brakes applied) that had been placed in the track about ​2 1⁄2 hours earlier. Canadian railways have not been metricated and therefore continue to measure trackage in miles and speed in miles per hour. ^ Hastings Racecourse Fact Book Archived 2012-04-18 at the Wayback Machine Like Canadian railways, Canadian race tracks etc, have not been metricated and continue to measure distance in miles, furlongs, and yards (see page 18 of the fact book). ^ a b c U.S. National Geodetic Survey. "What are the 'official' conversions that are used by NGS to convert 1) metres to inches, and 2) metres to feet?". Frequently Asked Questions about the National Geodetic Survey. Retrieved May 16, 2009. ^ Maloney (1978), p. 34. ^ Maloney (1978), pp. 34–35. ^ International Bureau of Weights and Measures (2006), The International System of Units (SI) (PDF) (8th ed. ), p. 127, ISBN 92-822-2213-6, archived (PDF) from the original on 2017-08-14 . ^ Rowlett (2005), "data mile". ^ Rowlett (2005), "radar mile". ^ Concise Oxford English Dictionary (5th edition; 1964). Oxford University Press. ^ John Heywood (1562). The proverbs, epigrams, and miscellanies of John Heywood ... Print. for subscribers, by the Early English Drama Society. pp. 95–. Retrieved 1 December 2011. Adams, Cecil (1990), "What's the origin of miles and yards? ", The Straight Dope, Chicago: Sun-Times Media, retrieved 6 April 2015 . The American Heritage Dictionary of the English Language (4 ed. ), Boston: Houghton Mifflin Co., 2006 [Originally published 2001], ISBN 978-0-618-70172-8 . Andrews, J.H. (15 September 2003), "Sir Richard Bingham and the Mapping of Western Ireland" (PDF), Proceedings of the Royal Irish Academy, Vol. 103C, No. 3, Dublin: Royal Irish Academy . Astin, A.V. ; et al. (June 25, 1959), "Doc. 59-5442: Refinement of values for the yard and the pound" (PDF), Washington, D.C.: National Bureau of Standards . Bigg, P.H. ; et al. (1964), "The United Kingdom Standards of the Yard in Terms of the Metre", British Journal of Applied Physics, Vol. 15, No. 3, pp. 291–300, Bibcode:1964BJAP...15..291B, doi:10.1088/0508-3443/15/3/308 . Burke, James (1978), Connections, Little, Brown, & Co., ISBN 0-316-11685-8 . Butcher, Tina, ed. (2014), "Appendix C", NIST Handbook 44: Specifications, Tolerances, and Other Technical Requirements for Weighing and Measuring Devices . Klein, Herbert Arthur (1988) [Originally published 1974], The Science of Measurement: A Historical Survey, New York: Dover Publications (Previously published by Simon & Schuster as The World of Measurements: Masterpieces, Mysteries and Muddles of Metrology) . Livy (1905), Lease, Emory Bair, ed., Ab Urbe Condita, Vol. I, XXI, & XXII, New York: University Publishing . Maloney, Elbert S. (1978), Dutton's Navigation and Piloting (13 ed. ), Annapolis: Naval Institute Press . Morden, Robert (1695), Dorsetshire, retrieved 17 August 2011 . "History of Length Measurement", Factsheets, Teddington: National Physical Laboratory . Norgate, Martin; et al. (1998), "Morden's Hampshire 1695", Old Hampshire Mapped, Hampshire County Council, ISBN 1-85975-134-2, retrieved 17 August 2011 . Oxford English Dictionary, 3rd ed., Oxford: Oxford University Press, 2002 . Rowlett, Russ (2005), How Many? A Dictionary of Units of Measurement, Chapel Hill: University of North Carolina, retrieved 10 November 2007 . Shuttleworth, M., Building Roman roads, Experiment Resources, retrieved 2 May 2011 . Smith, William, ed. (1875), Dictionary of Greek and Roman Antiquities, London: John Murray . Thompson, Ambler; et al. (2008), Special Publication 811: Guide for the Use of the International System of Units (SI) (PDF), Gaithersburg: National Institute of Standards and Technology . Zupko, Ronald Edward (1977), British weights & measures: a history from antiquity to the seventeenth century, University of Wisconsin Press, ISBN 978-0-299-07340-4, retrieved 26 November 2011 . Zupko, Ronald Edward (1981), Italian Weights and Measures from the Middle Ages to the Nineteenth Century, Philadelphia: American Philosophical Society, ISBN 0-87169-145-0 .